The Gemini III is a limited-edition multipattern version of the popular Gemini II microphone. 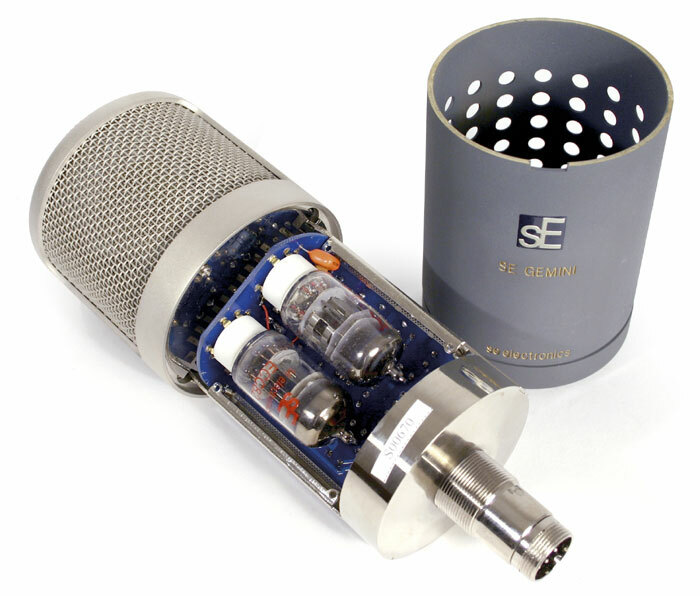 It was introduced in early 2010 for sE Electronics’ 10-year anniversary, and will be produced in a limited edition of 333 microphones. The Gemini, Gemini II, and Gemini III are dual-tube microphones. An ECC83 (12AX7) is used on the input stage, an an ECC82 (12AX7) is used for impedance conversion on the output. Both tubes are dual-triode designs, and both are socketed for ease of replacement. The picture at right, from SoundOnSound, shows the original Gemini with its cover removed. The Gemini III differs from the Gemini II primarily in the fact that it has three polar patterns. Needless to say, the III has a dual-diaphragm capsule, which may not be true of the fixed-cardioid Gemini/Gemini II. The Gemini III retains the onboard HPF and pad (-10dB) that were introduced in the Gemini II. Like the Gemini and II, the Gemini III is transformerless. The Gemini III is finished in matte black, and has sE’s 10-year anniversary badge on the front of the microphone. It will ship in the upgraded flight case used for the RNR1 ribbon, with its power supply, power cable, an elastic shockmount, and most likely a padded wooden storage box for the microphone.